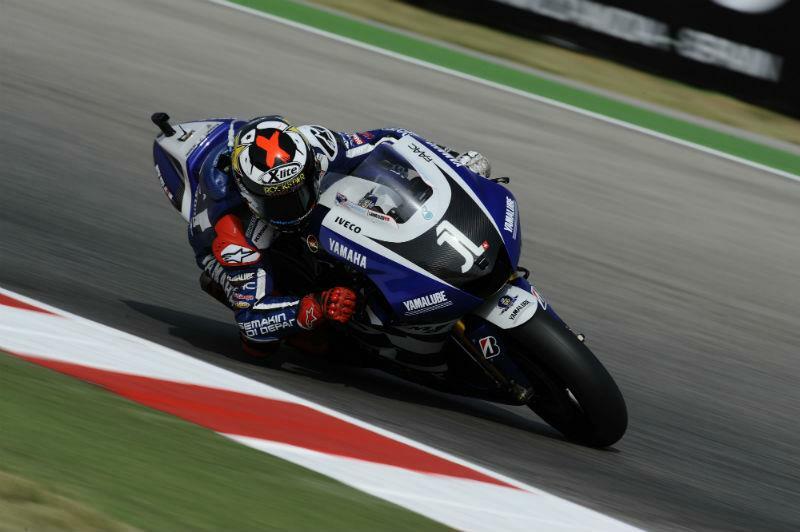 Jorge Lorenzo (Yamaha Factory Racing) made a very strong start at Misano to lead the race from start to finish, taking the lead from Casey Stoner early in the first lap and reducing Stoner's championship lead to 35 points. Lorenzo rode very consistently to stretch a gap of just over seven seconds over Repsol Honda team mates Casey Stoner and Dani Pedrosa, who pursued the Spaniard throughout the race but were unable to match the reigning champion's pace. Stoner doggedly chased Lorenzo for the majority of the race, but with six laps remaining team mate Pedrosa closed the gap, moving through to take second on the following lap. Stoner was unable to fight back and had to settle for third. Valentino Rossi capitalised on a great start, moving up from eleventh on the grid to pass Ben Spies and take fifth behind Andrea Dovizioso with Marco Simoncelli soon following suit, pushing Spies back into seventh. Rossi's team mate Nicky Hayden endured a disappointing race, crashing out on the third lap. Simoncelli passed Rossi on the inside to take fifth before moving through to take fourth from Dovizioso. With thirteen laps remaining, Ben Spies relegated Rossi to seventh to join the battle for fourth with Dovizioso. Monster Yamaha Tech 3 rider Cal Crutchlow passed team mate Colin Edwards at turn one with seven laps remaining to take ninth and ended the race in tenth behind Hector Barbera and Alvaro Bautista. Spies pushed hard to keep up with Dovizioso, who had started challenging Simoncelli for fourth with three laps remaining, before edging past to take reclaim fourth. Simoncelli fought to keep pace with Dovizioso, moving back into fourth until running slightly wide and finding both Doviziso and Spied looking likely to push the Gresini rider into sixth, however Simoncelli managed to cling on to fourth and just managed to hold off Dovizioso across the line with less than 0.04s seperating the Honda riders.